180 illustrated pages of core-system rules from character creation through to a monstrous bestiary, including 22 playable races and over 70 occupations. Detailing over 60 pages of spells and unique abilities available to the twelve magic-using occupations described in the Hexicon Rules Manual. Packed with detailed descriptions of armour weapons, consumables, herbs, poisons and other adventuring equipment. All of the Major tables and play aids used during character-generation and game play combined in one place for ease of reference. While Hexicon is adaptable to any medieval fantasy setting, it comes ready to play with its own fully developed and historically complete backdrop described in over 40 pages of detail. Don't compromise on your roleplaying experience. 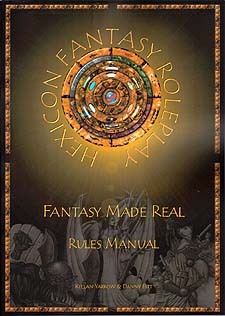 Hexicon Fantasy Roleplay offers you fantasy made real.